a. area of Δ DFB? b. area of Δ EFC? c. area of Δ DFE? d. area of Δ ADE? e. area of trapezoid DECB? f. area of Δ ABC? 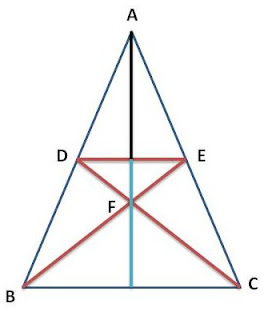 so the area of Δ DFE = (1/4) of ΔBFC = 20 = 5 square units. 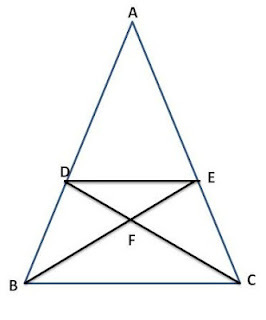 Δ DFE and ΔEFC share the same vertexs D and E respectively, so the heights are the same. Thus the area ratio is still 1 to 2. Δ ADE is 5 x 3 = 15 square units. The area of trapezoid DEBC is 45 square units. The area of Δ ABC is 60 square units. 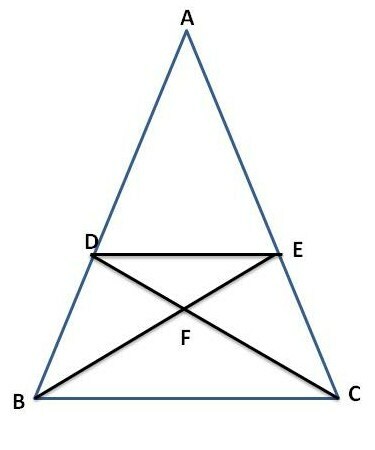 e. How many multiples is it of Δ ABC to ΔBFC?